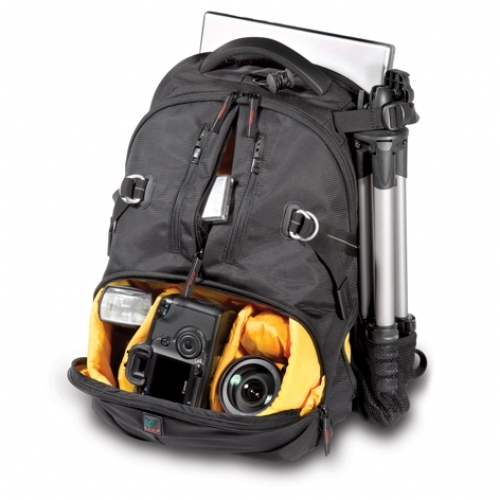 The DR-467i Digital Rucksack is the perfect daypack for up to 2 DSLR with mounted lens, 3-4 additional lenses (up to a 105mm f/2.8) and flash, OR a compact camcorder with accessories, as well as room for up to a 17'' laptop, tripod and personal gear. The main bottom compartment holds your Camera/Camcorder while the modular dividers will custom fit, organize and protect your additional gear. The large top compartment will hold personal gear or additional equipment, and the internal pockets and mp3 player pouch allow you to organize your personal effects as efficiently as your photographic gear. 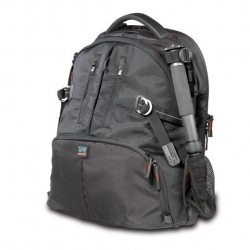 By removing the padded bottom insert and unzipping the mid section you can easily convert this rucksack from a camera bag to a daypack when not shooting. Ample external pockets allow quick zippered access to supplies and a water bottle/ tripod support pocket pulls out from a side pocket. A loop on both shoulder straps allows you to connect external pouches to carry a cell phone or mp3 player or to attach your camera using the KATA camera strap. Kata 467 is compatible with the Kata Insertrolley (KT VG-DTS, sold separately) - a simple yet ingenious system that allows you to carry the case, or even several cases at once, on a trolley. Simply slide the trolley through the integrated sleeve on any of KATA's compatible cases for secure and easy mobility. Even for larger cases - Kata's extendable wheel system helps to better stabilization. You can detach the trolley when you want to store it, or for maintenance. Kata 467 is compatible with the Kata Ergonomic PHoto system which will allow you to connect additional bags for extra carrying possibilities. You can add backpacks, torso packs or waist packs to any of your Kata EPH system compatible bags. The provided rain cover will protect your valuable equipment during extreme weather conditions. TST (Thermo Shield Technology) is a discreet solution that provides the perfect shock protection for your gear while creating an extremely lightweight product. It is featured on the most important areas of the bag that are subject to shock.